The inside now has a floor and firewall and sides, an the inner front fenders are there (even though you cannot see them). When I take sections of the model to continue on the 2D CAD drawings, this will be helpful. 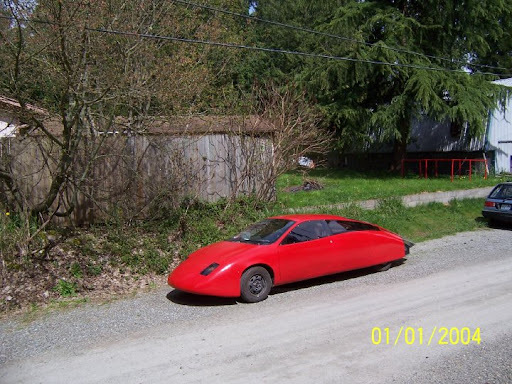 Post subject: Aptera 2e production vehicle revealed! Besides a few ill-fitting pieces (it is the first of this model to be built), this vehicle looks better than I feared. Unfortunately, the efficiency has taken a hit, and now it only bests other current designs -- it may not be better than the EV-1, which is disappointing, considering it weighs a *lot* less, and it has even lower drag. The drop in efficiency is quite puzzling, really. Thanks for the Aptera updates! 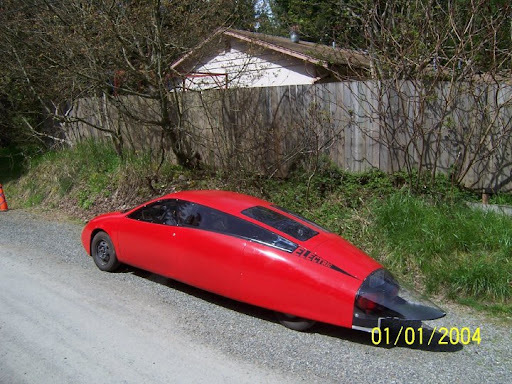 This is as near to perfect an aerodynamic package as I have seen, period. Sure, it is a little bit long, and the front license plate needs a spot other than the windshield... but this car is a stunningly beautiful thing. I found a page with more technical info: http://www.evalbum.com/3242. It is heavy, using sixty lead acid batteries that each weigh 33 pounds; totally 1,980 pounds for the batteries alone. 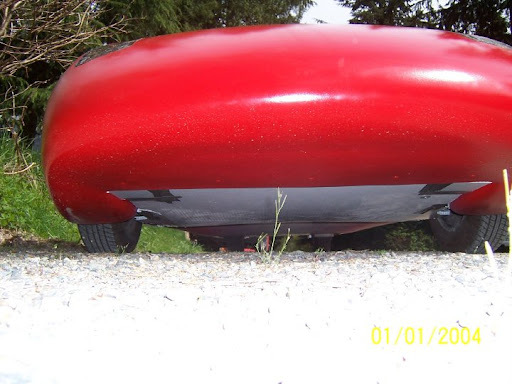 The car weighs 3,200 pounds. I am going to find out more about this car, and it's builder. Last edited by NeilBlanchard on Sun May 09, 2010 3:57 am, edited 1 time in total. I like that weight, 3200.
maine gets thrashed like every extreme in every state..all in one year. I have tried the little econobuggies. Death defying. I have an 87 subaru, welded and welded, and knew I was gaining on 3000 pounds when 80s mph and side winds stayed decent, going by rigs is not a two hands on the wheel panic. To see this car as aero'd and batteries is indeed amazing. 3200 is my goal for the 90hp subaru I am restoring.. it is of course games with unibody. IE: add 50 pounds around the struts and its 50 pounds on the scale.. but if to add 50 pounds to the belly, its like 200 on the scale.. I found thier tricks of lightweight tin cans appearing heavy a long time ago. All while not being a heavyweight at all. the goal of efficient is not just losing weight.. it must have weight to sustain todays speeds...and of course weathers. it is of course games with unibody. IE: add 50 pounds around the struts and its 50 pounds on the scale.. but if to add 50 pounds to the belly, its like 200 on the scale.. I found thier tricks of lightweight tin cans appearing heavy a long time ago. All while not being a heavyweight at all. Perhaps you could explain how you're violating the laws of physics? 50lb is 50lb, assuming you're actually weighing it properly. Well, being heavy make higher efficiency harder. A lot of stability in cross winds comes from aerodynamics of the body, and not from weight. 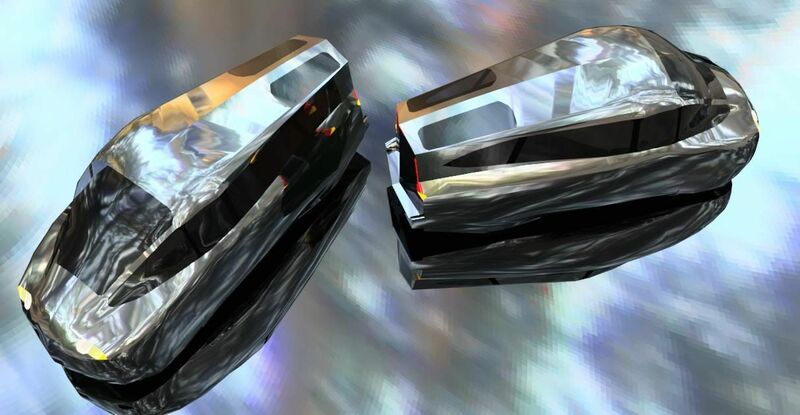 Two cars can weigh the same, and yet have very different stability in a cross wind. And it depends also on the direction of the cross wind. 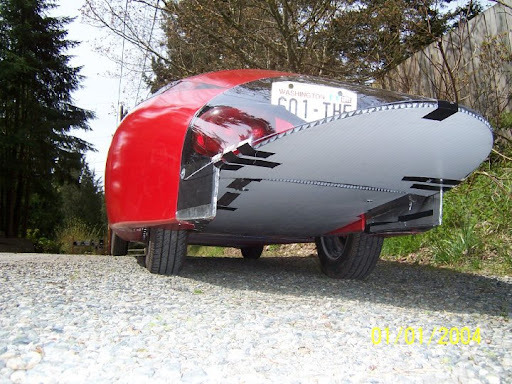 Dave Cloud, the builder of the Dolphin is still working on it -- that part of the tail was tacked in place to partake in the Electrathon a few weeks ago in Washington state. He is making a more finished tail, as well as some other tweaks. The efficiency will be getting a bit better -- at the moment, it is ~162-170Wh/mile, which is very good. Yes, it would be even better if he used lithium batteries that weigh a fraction as much (like 400-500 pounds vs the 1,980 pounds it is now) and it would also be helped by having regenerative braking, too. But, he is going for the record with lead acid batteries. I think that the X-Prize competition is fulfilling the objective of focusing on vehicle efficiency. Starting with the results so far, I am hoping to contribute to the discussion and to the process. I think these results speak for themselves! The electric cars are in general, giving much better efficiency, and several of those (the X-Tracer, FVT, Tata, and the Aptera) also have excellent acceleration. The Li-ion, Illuminati, TW4XP, and Edison2 (among others) were not as quick -- the Li-ion and Edison2 cars are through to the finals, though. I am sad that neither the FVT eVaro nor the Illuminati Seven made it through, due to (relatively) minor technical reasons. They failed at the moment (which is how racing/competitions work, to be sure), but I think their problems are solvable, and the strong merits of their vehicles are obvious. The Aptera is through, but still a bit disappointing -- it's aero is equal or better to anybody (save the X-Tracer), but their efficiency seems to have suffered. It barely betters the Tata, which is "just" a well executed EV conversion of a decent but ordinary hatchback. The Global-E had an ignition mapping error that made their number lower. So the lowest MPGe of an electric drive; the AMP'd Sky was 86.7MPGe (Tango was 86. , while the best of a car with an internal combustion is the Edison2 #97 at 101.4. (Actually, the FVT has a ICE powered generator onboard, but did not need it *at all* in the X-Prize.) The hybrids all were all below the 67MPGe -- except the WSU at 92.5 (and the FVT). The X-Prize results table does not include weights, but I daresay that the average weight of the internal combustion cars was lowest (the Edison2 and Spira are all much lighter!). The best aero drag is on the X-Tracer, followed by a very close group including the Aptera, Edison2, Li-ion. As many have said, the X-Prize is setting a very high standard (which is both good and bad). They are essentially looking for the complete package, and virtually no glitches. Even the well financed/professional teams had several glitches. I would have set up the X-Prize a bit differently; to measure (and therefore emphasize and encourage) the four main things that need to be improved to get the maximum efficiency. For Drivetrain Efficiency, the points awarded would be the best MPGe x Number of Seats. So, using the Overall MPGe for 23 vehicles that competed in the Knockout Round listed above (we do not have the separate measured results from the City, Urban, and Highway test): the X-Tracer #79 would be 188.8 x 2 = 377.6 points, and so on. The best mainstream MPGe was the Illuminati Seven: 119.8 x 4 = 479.2 points. 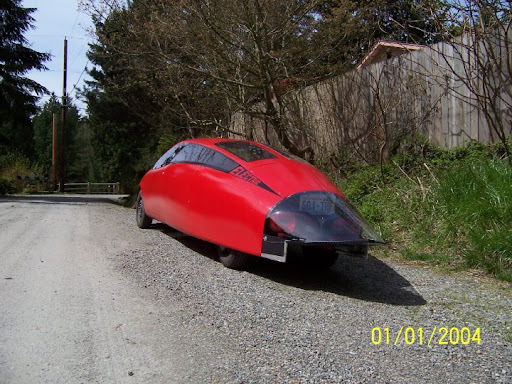 Aerodynamic Drag would use the Weight and the Rolling Efficiency, and the results of a Coastdown test to determine the Cd of each car. I would take the inverse of the number of entrants divided by the Cd, then multiplied by the Number of Seats: So the Aptera and the Li-ion and the Edison2 alternate cars may be at the top: 23 (22, 21) / 0.15 x 2 = ~306.6 and ~293.3 and ~280 points respectively. The Edison2 mainstream cars would get 20 and 19 (or higher depending on their Cd) resulting in 20 (19) / 0.15 x 4 = 533.3 and 506.6 points respectively. For Weight, I would take the lightest one and score it by inverting the number of Entrants x the Number of Seats â€“ the Spira would get 23 x 2 (seats) giving it 46 points. The Edison2 alternate car would be next with 22 x 2 = 44 points. 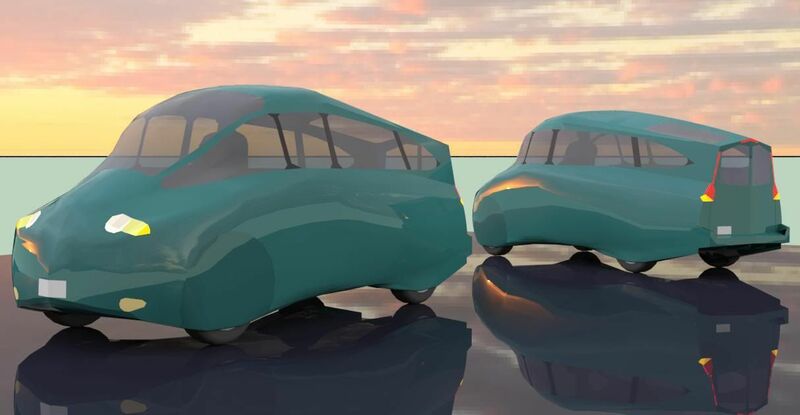 The two Edison2 mainstream cars would be 21 x 4 = 84 points and 20 x 4 = 80 points respectively; and so on. This give priority to the cars that seat more people, and it is realistic in terms of what is achievable in the real world. 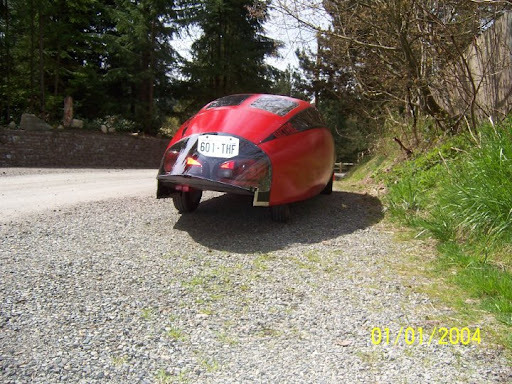 Rolling Efficiency includes tires and alignment and would be prorated for weight â€“ a slower coastdown test using a ramp would be needed. I think an inverted number of the entrants would be a fair way to award points. Obviously, all four of the critical factors are interrelated, and they all would be reflected in the Overall MPGe number â€“ but testing for them and awarding points (in some manner) for them separately, helps focus the designs on the most important aspects â€“ and more importantly helps demonstrate their performance; whether or not the designs get ALL of them right and in the right balance, and if there is something that lags (or breaks) and the vehicle is DQ'd, people will still be able to judge the merits of the design. We could quibble about how each of these was scored â€“ I am just throwing this out there. At this moment in time, I feel that the emphasis on the safety, and meeting the letter of the rules, etc. are distracting the designers from the main point; of maximizing the efficiency. Obviously, for a finished, production, reasonably priced, appealing vehicle â€“ ALL of these things are also critically important. These would be determined by finished vehicle, and the buying public. But, I feel that an emphasis on the overall efficiency, and the four most important factors that directly contribute to maximum efficiency, would have better served the purposes of the X-Prize. One of the most important things I learned while I was at the X-Prize Knockout competition was: do not dismiss or ignore anybody! There is a LOT more than meets the eye with all of the entrants, and no matter the results, all the designs have strengths â€“ and weaknesses that are all very informative. I also was floored by the height of passion by so many people. The sight of Oliver Kuttner with tears streaming down his face; returning from the starting line of the City Test with the first of his cars about to actually get to the heart of the matter; moves me to tears, as well. And I'm quite sure that every person involved in the X-Prize, who has put in a similar Herculean effort, feels the same. 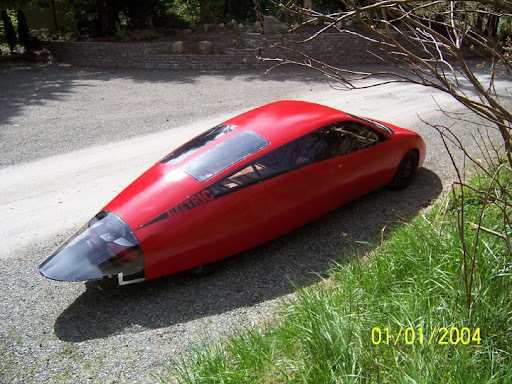 Another great post on your blog Neil, I love reading about those amazing cars !! How's your car design project going btw ? I haven't seen an update on your blog in a while. 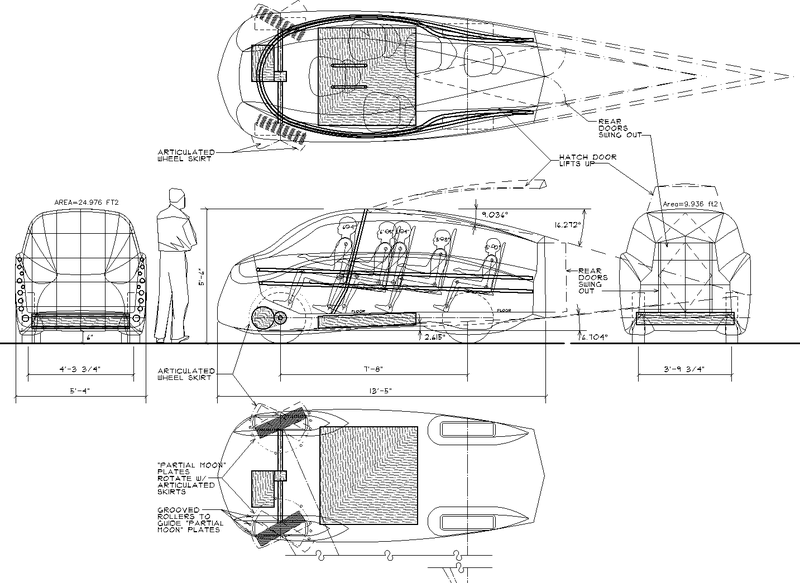 So, I am continuing work on my CarBEN design (which would be a mainstream 5-seat design, that is less than 14 feet long, and I think the aero could be equal to or better than anything at the X-Prize! ), and I would like to plan on using FVT's EiG batteries and electric drivetrain. Initially, I want to try to meet or exceed the mainstream range as an EV. And if I can fit a really big battery pack (40-60kWh) then I would like to at least plan for this. The intended location for the battery pack is under the floor (the shaded 4'x'4'x6" box on the drawing) and this could be altered/enlarged. I like the direct drive, but I also think that 8-10s 0-60mph would be plenty! The CarBEN chassis would be best (I think) as a composite foam sandwich (which provides thermal insulation along with good strength) and I think it will be light weight. If anyone would like me to send drawings, and/or computer files, I'd be happy to do this. I now have several versions of the solid model of CarBEN! I have a .STEP, .STL, .CGR (and a 3D PDF, too) -- if anybody can do a CFD test using these, I would greatly appreciate it! As usual, Robert Llewellyn gets to the heart of the matter. I hope that you get to watch these videos -- Robert takes on Top Gear (and their anti-EV stance), and many of the myths and FUD surrounding EV's, and he doesn't blink at the downsides of EV's, either. His show used to be called Gearless: http://www.youtube.com/user/GearlessUK and I agree that Fully Charged is a much better name. 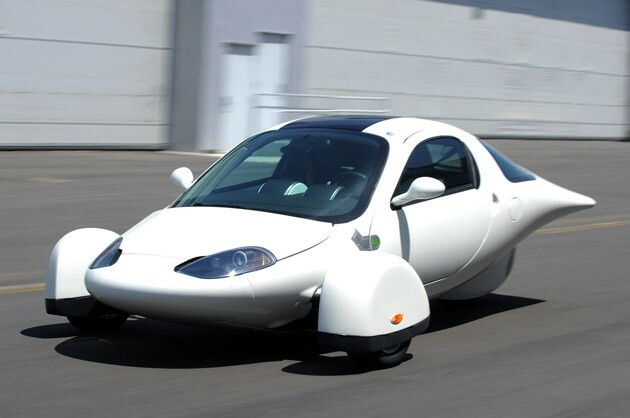 I'm wondering why Tesla doesn't come up with a more mainstream car... I'll be very willing to spend a littel more on a electric car than I would on a gasoline car, but that roadster is out of my price range Their new model S looks good too, but I'm already seeing lots of $$$ just by looking at it. I really can't wait for more electric cars to come out !! @ Neil : Speaking of cars, I'll be on the market for a car as soon as I have found a job (haha). I've started looking online but appart from the great mileage of the prius, the other hybrids are a joke !! With my previous car I was able to get the same mileage most of those "green" cars get. Any recommended brands/models ? The Tesla model S may be exactly what you are looking for? 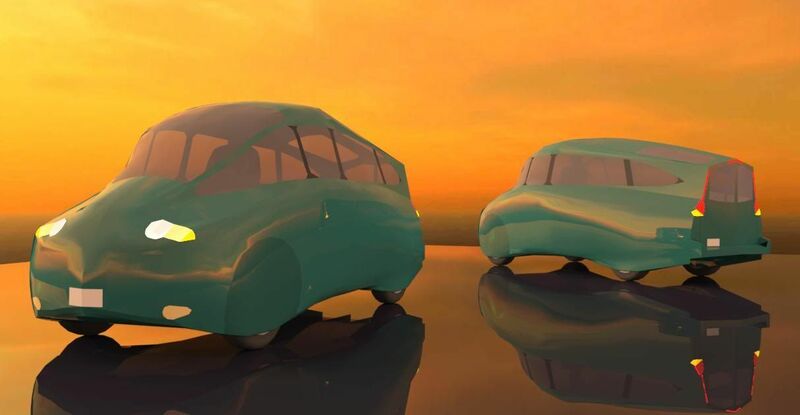 Here are some renderings of my CarBEN EV concept, done for me by C. Michael Lewis, from Portland ME. 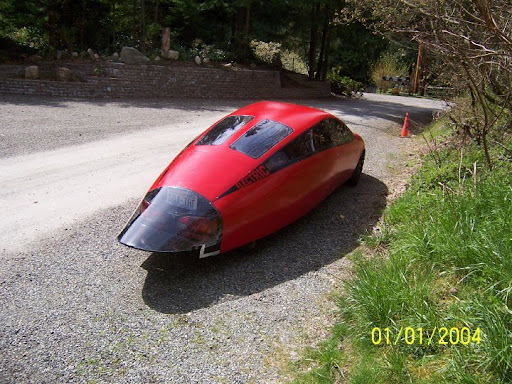 Proving it is a small world, he works both in architecture (and has mutual friends) and he races in the Electrathon series, and he currently holds the speed record of 62 Miles in an hour; while getting 2,249MPGe! Last edited by NeilBlanchard on Wed Jul 14, 2010 12:25 pm, edited 1 time in total. 1. Not likely to get anywhere near acceptable crash test results. 2. How are people going to change flat tires? 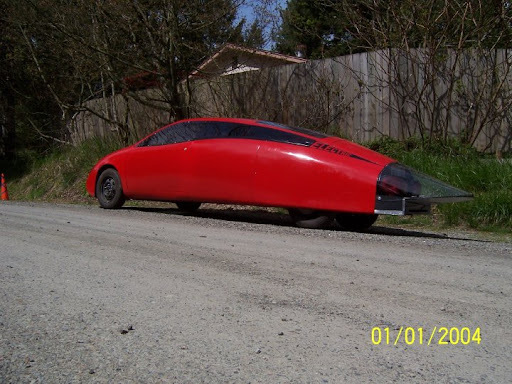 It's a concept car. Did you read my description in by blog? 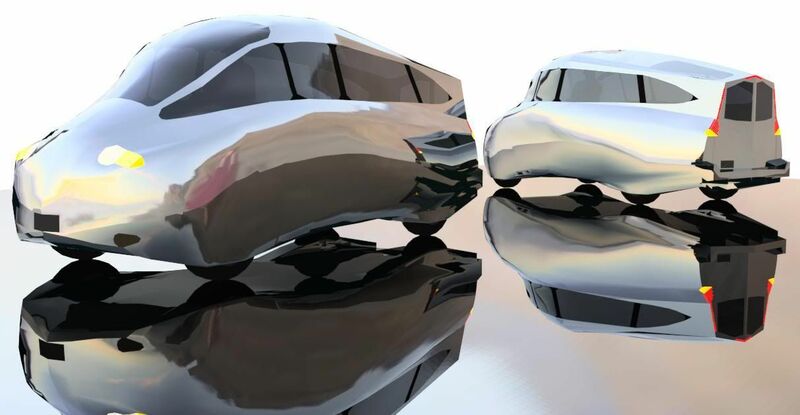 It is very possible that it would be better than many cars in a crash, because I would have a continuous structure on the front and sides, around the passenger compartment. Safety is at the forefront of how I designed it; along with keeping it as low drag as possible (it could be *the* most aerodynamic car, or nearly the best ever made), and still be a light weight as possible. 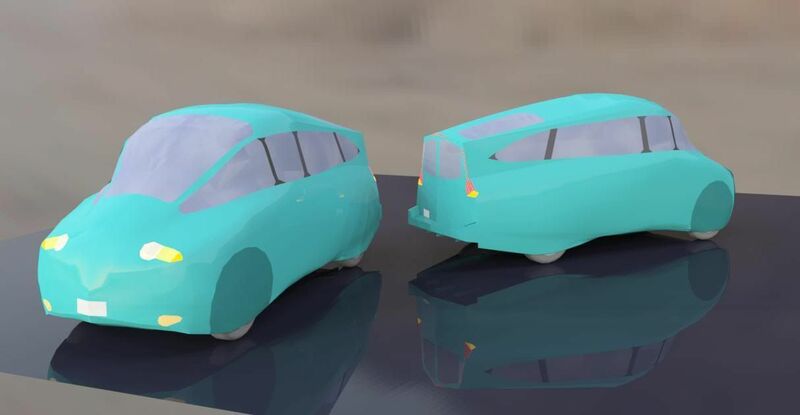 The continuous surrounding structure (and appropriate crumple zones) would be made possible by the unconventional method of getting in and out of the car. I put a lot of thought into this, and I'll let you read my blog entry describing more of the details. There are more pictures there, and a couple of video animations of the model in SketchUp. Of course, there would either be panels to remove to get access; or, I would completely engineer new solid wheels (no air inflation) and the suspension to go with it. 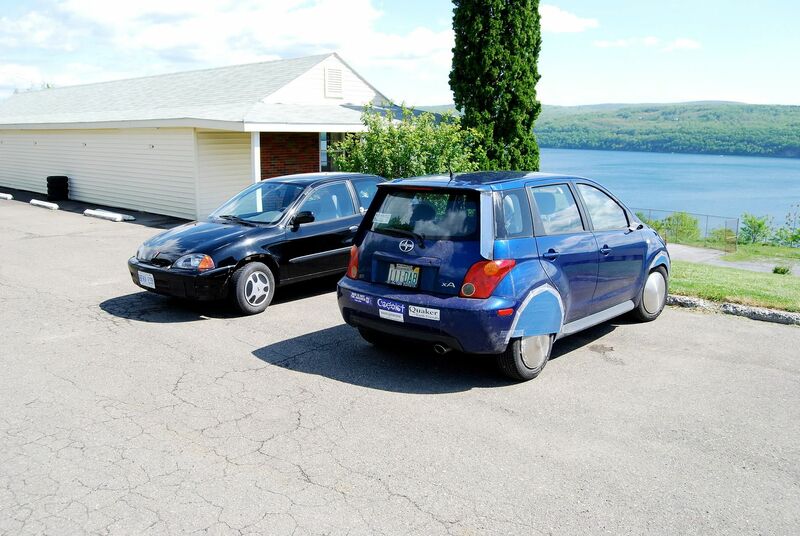 The latter solution would offer both very low rolling resistance and if it had regenerative shock absorbers, it would regain more energy than if the tires absorbed much of the bumps. 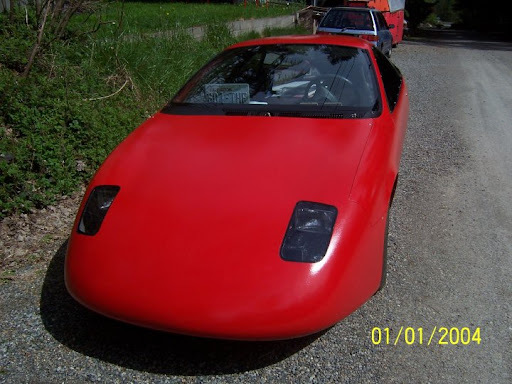 I hope to actually build this car, and I hope to show what it can do. It has the potential of being the most efficient car ever made. And, I hope that it is actually very practical, and safe as well. I realize that it is just a conceptual design, but in the drawings the pillars are way too thin to survive a rollover with high crash test scores. You're right, they are fairly slim. With no side doors (ideally, if this entry scheme works), then the only structural "holes" in the front and sides of the car, are the windows. With conventional side doors, the openings are much taller, and the doors are essentially disconnected structurally; and they do not support the roof much. The windows pillars are spanning a much shorter distance, and so they do not have to be as thick as a "normal" car. The top hatch door and the rear doors would have multiple latches to structurally join them to the rest of the car. So, I am aiming for a composite foam sandwich structure (to provide good strength, light weight, and thermal insulation), with continuous wraparound structural cage on the front and sides; room for 4-5 people (the front 3 figures are 6'-4" tall, and the next 2 are 5'-8 and 5'-0" respectively), enough room in the floor for a ~32-50kWh prismatic battery pack, hopefully weighing 1600-1800 pounds, and having a CdA >3.75 sq ft and maybe as low as 2.75. Oh, if a second means of egress is required, I'd put a hatch door in the roof just above the driver. And if the rear hatch entry proves impractical, then I'd go with side doors that have multiple latches. This would add some weight, though; and I don't think it would be as strong, either. The other purpose/result of the staggered/offset seats is the legroom is flexible, and people can stretch out to the side, to help avoid getting cramped or uncomfortable. Also, note these seats are curved mesh surfaces, stretched over frames; to provide comfortable ergonomic seating (the proper angles and shapes are key! ), while taking up a minimum of space and good air circulation. Something I have forgotten to mention before now is the frontal area is shaped somewhat close to square -- this encloses the most interior volume for a given frontal area, and that makes it easier/more practical to use. You can get upright seating (which I find very comfortable), and that in turn allows you to fit more "rows" of seats than you otherwise would. 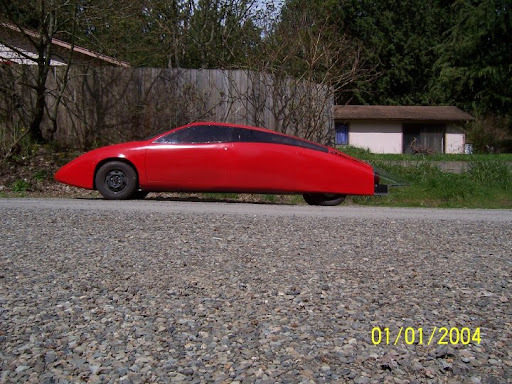 This car is less than 14' long, and just 5'-4" wide. 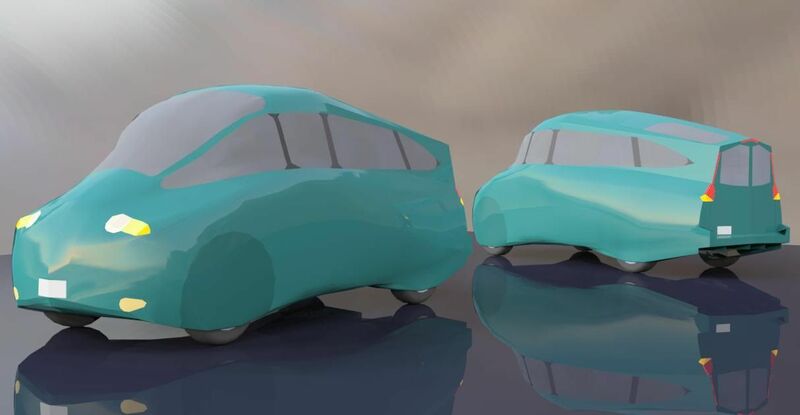 Naturally, I'd use side video mirrors; or optical mirrors on the inside, to avoid the additional aero drag. I do hope to build it, sooner rather than later; but if you want me to send you the SketchUp model and/or the CAD drawings, so you or someone you know wants to build it, then I'd be happy to send them to you. Really don't like the height of the thing, makes it look weird. This entry scheme reminds me of IFV like Bradley or BMP-3. Including the ducking to get to the seats. So it is more tricky to get into but quite a bit taller than regular cars? I need to built it to test the method of entry -- I do not want to dismiss it out of hand, because it has some great advantages. 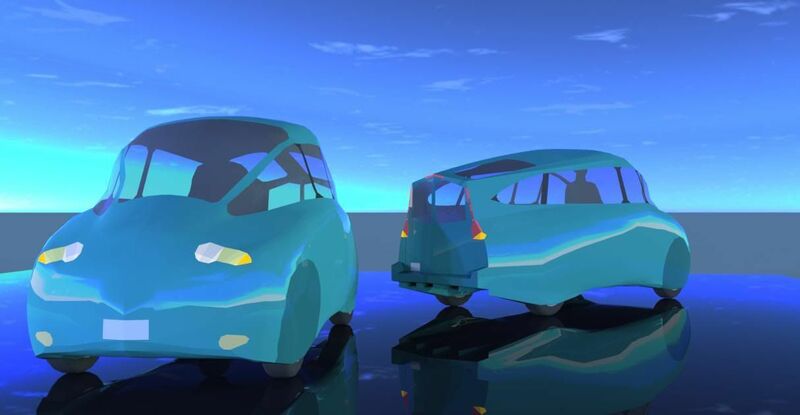 Most new super-efficient cars have some unconventional compromises -- because if you design a conventional car, you are almost guaranteed to have a conventionally efficient car as well. Most new super-efficient cars have some unconventional compromises -- because if you design a conventional car, you are almost guaranteed to have a conventionally efficient car as well. One is Opel Kadett A 1966 from Top Gear - lightweight "conventional" setup without ANY gizmos. Imagine building same car with more modern body, suspension and engine! Unfortunately not making any noise lately and the site is down. Right -- the safety of the Loremo is probably much better than the Kadett. Side door could be made safer -- by using multiple latches, and this is my fall back position on the CarBEN design. 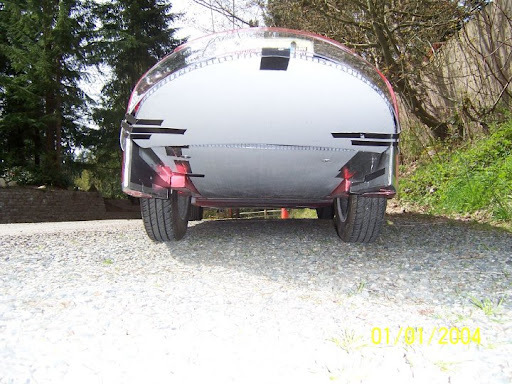 But I'm fairly sure that having a fully contiguous structure around the front and sides of the car, will be both safer and lighter than if side doors have to be used. Starting tomorrow at 8:30am EST for Group 1 of the Highway Efficiency Test, 12:00 noon EST for Group 2, and 2:30pm EST for Group 3. This on-road efficiency test mimics the type of efficiency testing that occurs in industry/government testing. The highway portion of the test is 90 miles (45 laps) at an average speed of 45 MPH with one (1) stop every 10 miles (5 laps). Your vehicle must achieve at least 100 MPGe and less than or equal to 200g/mile CO2 to continue. Friday is the Range Test. Thanks for the link !! quite interesting ! so how did they fare?